Sitting on the banks of the River Aire, Queen's Mill was once thought to be the largest stone grinding mill in the world. According to the West Yorkshire Archaeological Society there has been a working mill by the River Aire as far back as Roman times. During medieval times the mills were used mainly for milling wheat, and they continue to do so. Now looked after by the Castleford Heritage Trust, visitors are invited to explore the mill during special open days throughout the year where members from the trust will be on hand to share the history of the mill and answer any questions. It is also used as a venue for local events. One such event, the Castleford Beer Festival took place last month, a community event drawing in the crowds with musical art, food and of course beer. However James Knowles, project manager at Castleford Heritage Trust explained: "The venue was all ready for the festival which was set to attract over 1,000 visitors. However, we had an issue with the function room: it only has one emergency escape and so we had to install a bridge so that, should visitors be required to leave the building in an emergency, they could do so safely. Without the bridge, we would not have been able to use the room." Thanks to a recommendation from a rigging company working on the project, James got in touch with Linda Martin at Rope Assemblies who, along with Joanne in the sales team, advised on the right product for the job and sent out some samples. She explained: "For a job like this we recommended 5mm stainless steel assemblies, with M10 Swage Studs on either side. Not only is it aesthetically pleasing but it is hard wearing and a better solution than galvanised items as it stands up to the elements much better. James was delighted with the samples and so placed an order for over 107 metres." Just last month the Rope Assemblies' sales team received a special commendation at the LEEA Awards for their customer service and Linda receiving a 'Manager of the Year' commendation, both for 'setting an exemplary standard within the lifting industry', and James can see why. "Rope Assemblies were amazing at turning around our request and delivering the order in a matter of days. 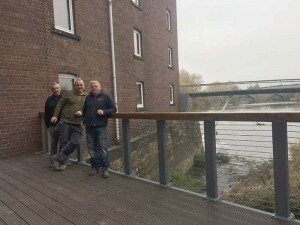 The wires are great; rated to 300kg each, they're more than adequate to act as a safety barrier underneath the handrail to ensure that no one could fall through the structure," James said. He concluded: "The Rope Assemblies team were brilliant to work with; if you're ever unsure about something, they explain it all in layman's terms how it all works and advise on everything from the diameter of the wires your require to how you'd terminate it. Time and cost were an issue on this project and they came up with an effective solution that meant we met our extremely tight budget and to deadline, making our first large event a resounding success." In picture: Site contractor Colin Wilson, contractor Paul Ellis and volunteer John Bell.